I’ve had two weeks off over the Christmas and New Year period and we’ve had some fantastic weather, especially today as I write this on New Years Eve, it’s a perfect day for the fireworks which will be lighting up Sydney Harbour later this evening. I managed to get one beach visit in so far which is where the image above was taken. I recently got myself a new Samsung Omnia mobile phone which has a 5 mega-pixel camera so have been playing around with it. I tried the panoramic setting and was amazed how good it was and how cool the pics looked, I just wish they were a bit bigger. You should open the image full size to see the detail. Off to the beach tomorrow for New Year’s Day I think as it’s supposed to be 34°C so be good to be near some water…..the only problem being when the air temperature is hot the water feels bloody freezing! So it’s that time of year again where the Christmas parties get in full swing, Friday 12th December was my work party at Doltone House at Jones Bay Wharf in Pyrmont. Although it sounds like it should be some sort of large house set in beautiful gardens, Doltone House is actually a converted wharf on Sydney Harbour which is one of many dotted around the harbour originally used to receive goods that came into Sydney by boat. Summer was on hold with crappy, rainy and cool weather for the evening but the space inside was huge and comfortably accommodated the 400-odd guests. 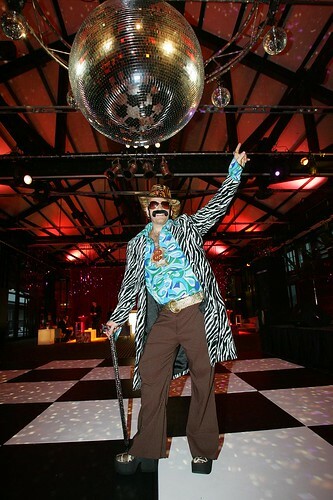 The theme if you hadn’t gathered already was ‘disco’ so had to push the boat and get pimped up for the evening. Most of the outfit was hired however the hat and cane were bought from dollar shops and pimped up personally. The cane took a couple of hours of sticking on jewels and sparklies and the hat was pimped with a few jewels too. After an evening of walking around in giraffe skin platforms I knew how women felt but it was great to be about three inches taller, will be looking into leg extension surgery in the new year! Definately the best Christmas party this year. Well more bathroom sink and shower…..anyway, last week I finished a course called ‘Camera Raw’ at the Australian Centre for Photography, Paddington, Sydney. It was a 5 week course explaining how to work with raw files and Photoshop’s Camera Raw plugin. Before starting the course I was shooting RAW+JPG out of the camera and pretty much never touched the RAW files as I didn’t have the faintest idea what to do with them. 5 weeks later and I’m only shooting RAW and have discovered the delights of using Bridge and Camera Raw to process the files. 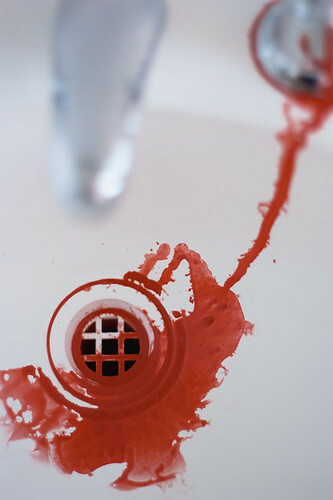 So what’s that got to do with a bathroom murder? The image above is from a series I took for the course and it’s the one I’ve selected for the end of term exhibition, it will be printed on A2 metallic paper so should look pretty cool. You can find the whole series on flickr. I’ve been doing a course at the Australian Centre of Photography over the last 5 weeks…..more about that in the next post though. 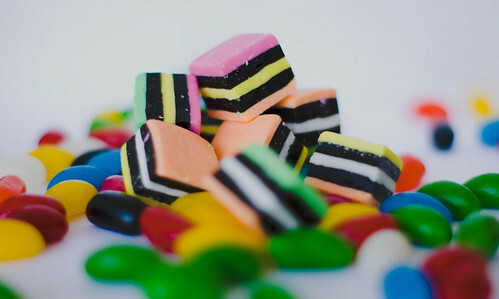 As part of that course I spent some time on a mini-project taking pics of sweets; liquorice allsorts and jelly beans to be precise. In one of those language quirks the Aussies call sweets ‘lollies’, which is bizarre coz in the UK a lolly has to have a stick in it, and for the benefit of any American readers sweets/lollies = candy. So if you enjoy salivating over images of yummy food go take a look at the whole collection. Earlier in November the 30th Annual Newtown Festival took place at Camperdown Park in Newtown, Sydney. The festival began in the late 70s as a fundraiser for the Newtown Neighbourhood Centre and has grown into one of the biggest neighbourhood festivals in Sydney. It features free live music, events, workshops, arts, crafts, children’s rides and food. On the three occasions that I’ve attended the festival has always been blessed with great weather and it was the same this year. I wandered around snapping away together with god knows how many other photographers. I was sitting down next to a footpath taking random pics of people as they walked by when this girl spotted me and rushed up to the camera and blew a kiss into the lens, that resulted in my favourite pic from the afternoon above. 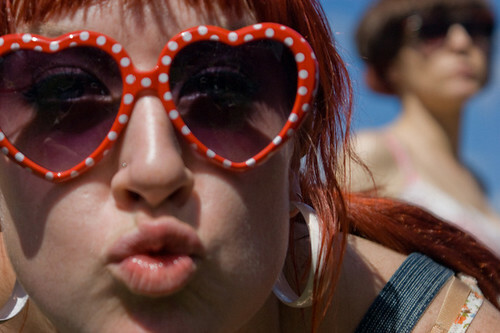 So thanks to the girl in the sunnies. Every year around this time one of the most famous suburbs of Sydney hosts Sculpture by the Sea. 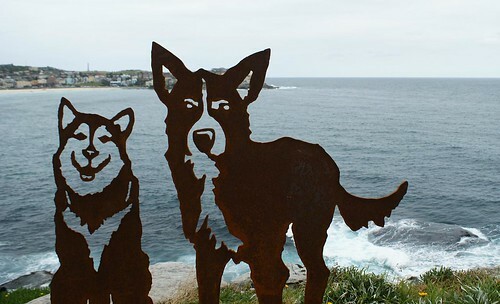 The exhibition is outdoors and runs the length of the Bondi to Bronte walk which is about 3km and hugs the side and tops of the cliffs and beaches which form the route. I visited on the last day and as expected it was ridiculously busy as everyone turned up at the last minute. The subjects were pretty varied ranging from strange abstract shapes, to huge rocks wrapped in fabric, to something a little more identifiable such the dogs above. Unfortunately it was a bit of a dull cloudy day so the light was a bit flat. Because of this some photoshop work has been done to bring out the colours and there’s a bit of cropping too. Visit flickr for the full set. Last Sunday (26th October) was the Danks St Festival in Waterloo. Danks St is know for is furniture, art, design and cafes/restaurants. The general vibe is all the cool kids coming down for food and to hang out listening to the music on the main stage or down at the DJ stage. Street photography is always a difficult one and you’re relying mainly on having interesting people to take photos of. 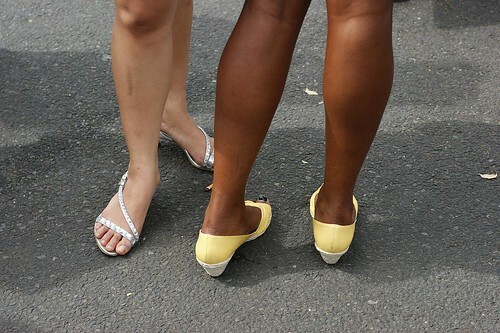 There were a few things that stood out including footwear, hair and designer sunnies. I also stumbled into a light shop with some very funky light fittings. 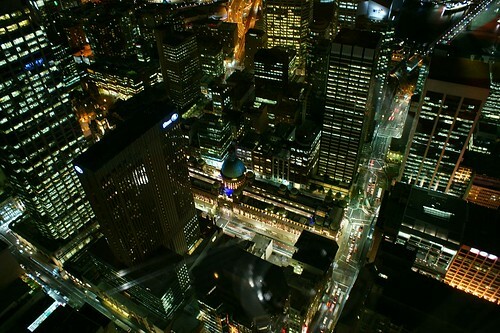 A couple of weeks ago I headed up Sydney Tower for the first time in years and took a few shots of the city at night. The images are quite abstract and you have to look closely to work out the landmarks. Locals will spot the Queen Victoria Building in this picture. It’s the only public place in Sydney where you can get this sort of city view. Visit the full set on Flickr. After not posting anything for months I’ve had a little rethink over the direction of the blog. So you’ll have noticed a big overhaul in the design as I’ve moved from Blogger to WordPress (thanks WordPress for making it sooooo easy!). Gone is ‘An Englishman in New South Wales’ though I still actually am an Englishman in NSW and all the old posts are still here. However as photography is my passion I want the blog to concentrate more on my photography and also the images of others. Hopefully (and I know I’ve said this before) the posts will be more frequest so there’ll be more reason to subscribe and come back. 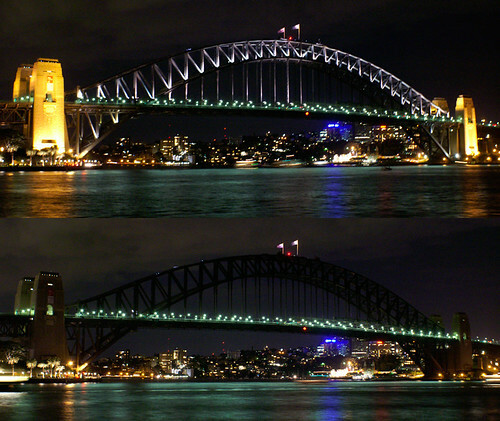 This evening Sydney switched off its’ lights between 8pm and 9pm for the second Earth Hour….well most of its’ lights, oh ok, maybe about 60%, you still need to be able to see where you’re going you know. Most significant were the switch offs at the Harbour Bridge and the Opera House. Sydney held the first Earth Hour last year and this year it has spread to over 370 locations including New Zealand, US, Canada, UK, Europe and the Middle East. Is it really useful? Will it really help? Well I guess it’s all about raising awareness, though some people think the exercise is so pointless that they’ve created an anti Earth Hour petition encouraging people to turn everything on for the hour, doesn’t look like it was a big hit though with only 87 signatures. Critics from last year pointed out that the amount of energy saved would only be the equivalent of taking 6 standard cars off the road for a year. Personally I was out taking those pics so no lights were on in my place, effectively I just saved the planet….yay, go me!